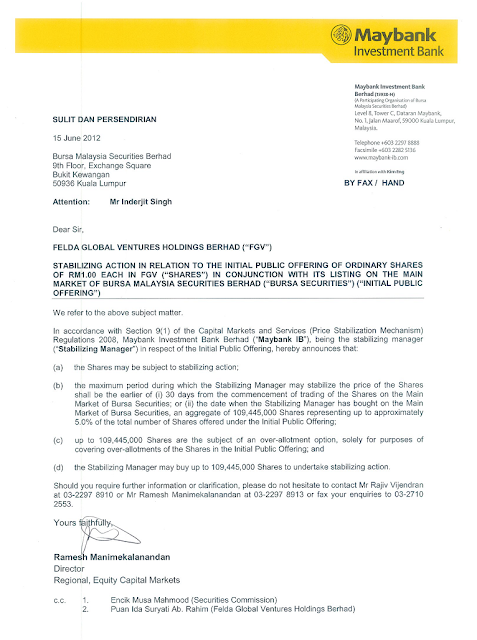 SERIOUS Investing: FGVH's price stabilization or "distortion" mechanism? FGVH's price stabilization or "distortion" mechanism? After all the confidence in the FGVH IPO, they are going ahead to go for the price stabilization mechanism or "greenshoe" some may call it. Several companies have used this mechanism with success. Among them, Petronas Chemical, MSM although the first to use this, Xingquan had seen its shares tanked despite using this option. Basically FGVH will be much different though. I am wondering why are they proposing this option if the confidence level was so high and despite having secured several cornerstone investors initially. The greenshoe option however could be used to attract these cornerstones. Normally the term cornerstone does not coincide with the need for greenshoe, although these cornerstones may disagree. Price stabilization mechanism may sound nice, but if used carelessly can be a "price distortion mechanism". Hey, for the stakeholders it is stabilization in the name but for me it is a distortion of market pricing. Tell me here, who has the power to distort the price - retailers? If we noticed, so far companies that used this mechanism since the introduction by the market in 2008 was either GLCs or those companies that have low investors confidence. On another note, the IPO ended with final retail price of RM4.45 and institutional price of RM4.55 per piece. For read up on price stabilization mechanism or greenshoe. The mechanism by which the greenshoe option works to provide stability and liquidity to a public offering is described in the following example: A company intends to sell 1 million shares of its stock in a public offering through an investment banking firm (or group of firms which are known as the syndicate, whom the company has chosen to be the offering's underwriter(s). The underwriters function as the broker of these shares and find buyers among their clients. A price for the shares is determined by agreement between the company and the buyers. One responsibility of the lead underwriter in a successful offering is to help ensure that once the shares begin to publicly trade, they do not trade below the offering price. When a public offering trades below its offering price, the offering is said to have "broke issue". This creates the perception of an unstable or undesirable offering, which can lead to further selling and hesitant buying of the shares. To manage this possible situation, the underwriter initially oversells to their clients the offering by an additional 15% of the offering size. In this example the underwriter would sell 1.15 million shares of stock to its clients. When the offering is priced and those 1.15 million shares are "effective" (become eligible for public trading), the underwriter is able to support and stabilize the offering price bid (which is also known as the "syndicate bid") by buying back the extra 15% of shares (150,000 shares in this example) in the market at or below the offer price. They can do this without the market risk of being "long" this extra 15% of shares in their own account, as they are simply "covering" (closing out) their 15% oversell short. If the offering is successful and in strong demand such that the price of the stock immediately goes up and stays above the offering price, then the underwriter has oversold the offering by 15% and is now technically short those shares. If they were to go into the open market to buy back that 15% of shares, the underwriter would be buying back those shares at a higher price than it sold them at, and would incur a loss on the transaction. This is where the over-allotment (greenshoe) option comes into play: the company grants the underwriters the option to take from the company up to 15% more shares than the original offering size at the offering price. If the underwriters were able to buy back all of its oversold shares at the offering price in support of the deal, they would not need to exercise any of the greenshoe. But if they were only able to buy back some of the shares before the stock went higher, then they would exercise a partial greenshoe for the rest of the shares.